I was a gift to my "mom"..Her last dog went to doggie heaven,and she was all alone (well,she had a cat, yuck).. When she got me,she was worried about my reputation, never having a "Pitty" before..She (being the wise woman she is) looked up everything she could find about me on the internet, and found out I could be her bestest friend in the whole world..We have been together now for over 2 years, and have become a team. You don't see one without the other. I make her smile and laugh, she makes my tail wag, and I give her sloppy kisses..Now the cat is my personal play toy. He makes really funny noises when I put my feet on him, but he also kisses me and naps with me, and I get him wet with my kisses, but he likes it..
Now about my name....Mom knew I was coming to live with her, and thought a long time for a special name for me..When we got to my new home, my man said "here she is stinky" my mom laughed and kissed me and said welcome home Stinky..
Join in and write your own page! It's easy to do. How? Simply click here to return to Pit Bull Pictures. Are you enjoying this site? Finding it useful? 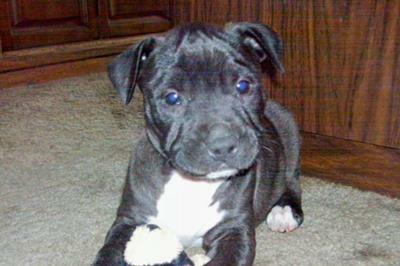 who want to know the truth about pit bulls. I promise to use it only to send you Bully for You!. Copyright© 2006-2012. The-Proper-Pitbull.Com. All Right Reserved.